Is it better that a guilty person goes free than an innocent person suffer wrongful conviction and imprisonment? According to many long dead jurists, the answer is a resounding "yes." In 1769, for instance, William Blackstone wrote in his Commentaries on the Laws of England that "[i]t is better that ten guilty persons escape than that one innocent suffer." And Judge Learned Hand described the "ghost of the innocent man convicted" as "an unreal dream." Unfortunately, the innocent man convicted is far from unreal in the modern American criminal justice system. As of 2016, the National Registry of Exonerations listed over 1,900 wrongful convictions. Given the inordinately high bar for exoneration that number is likely far lower than the actual amount of men and women who have been wrongfully convicted in American courtrooms over the last several decades. The plight of the incarcerated innocent is far from a dream, of course. The prison system is no picnic, and while an argument can be made that convicted criminals deserve to suffer in prison, no such claim can be made about someone imprisoned for a crime they did not commit. Many men and women have spent decades in prison despite having done nothing wrong. Alton Logan is one of them. He spent 26 years locked up for a murder that he didn't commit. In and of itself, Logan's situation is not that abnormal in today's criminal justice system. Other than one simple detail, Logan would be just another one of many unfortunate souls who went to prison for a crime they didn't commit. The detail? Two criminal defense attorneys knew for a fact that Logan was innocent from the very beginning. And they did nothing about it for 26 years. 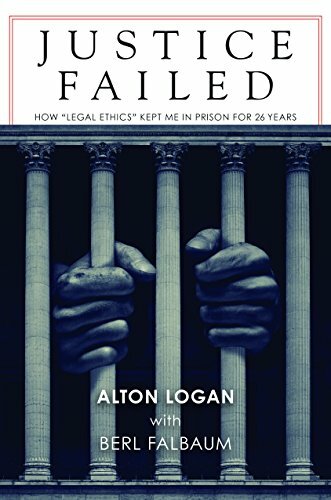 In Justice Failed: How "Legal Ethics" Kept Me in Prison for 26 Years, Alton Logan and investigative reporter Berl Falbaum explore the unprecedented and horrific reason that Logan spent 26 years locked up. Attorneys Dale E. Coventry and William Jamison Kunz were told by their client, Andrew Wilson, that he killed Logan's alleged victim. But because Wilson told the public defenders in confidence, canons of legal ethics strictly prohibited Coventry and Kunz from revealing their client's shocking declaration. So the two sat idly by and watched as Logan was twice convicted of a crime that they knew he didn't commit. Logan narrowly avoided the death penalty at his first trial, but was twice sentenced to life imprisonment. For more than two decades, Logan sat in prison an innocent man. Fortunately, the two lawyers were able to eventually help Logan prove his innocence. They convinced the real killer to allow them to record an affidavit attesting to what he had told them. Sadly, however, Wilson demanded that the affidavit not be released until after his death. So the proof of Logan's innocence sat in a lockbox under attorney Coventry's bed for a quarter of a century. Ultimately, Wilson died in prison, and the affidavit was produced. Much legal wrangling ensued, and Logan was eventually freed. He was also declared innocent of the crime and received over $10 million in compensation. But how could Coventry and Kunz have let an innocent man sit in prison for 26 years when the key to his freedom lay under the bed? Both attorneys defended the decision by citing the inviolability of the attorney/client privilege. Indeed, they argued, had this absolute privilege not existed, it was possible that Wilson would not have revealed his involvement in the murder at all. Logan points out, however, that the lawyers' commitment to client confidentiality directly conflicted with their amoral and unethical decision to let someone rot in prison for 26 years. Nevertheless, he seems to have forgiven the attorneys for their decision. In Logan's mind, they were the only ones that actually followed the rules. Alton Logan's story is tragic but enlightening. Justice Failed allows the reader to see just how easy it is for an innocent man to be convicted of a crime. Logan and Falbaum go through the details of the arrest, trial, conviction, retrial, and second conviction in detail, and the reader has the benefit of knowing that Logan was innocent the whole time. That perspective allows for a uniquely powerful insight into how we determine guilt and innocence, as well as the consequences of that determination. Alarming and timely, Justice Failed is a must-read for anyone hoping to better understand the reality of modern American criminal justice.